Some professional athletes have ruined their reputations and careers when routine drug testing revealed that they had been using anabolic steroids. Have students decide if they support (pro) or disagree with (con) routine drug tests for athletes. Have each side (pro and con) present their main points to the class. Make sure students emphasize the brain and body effects of the drug and how this information should be considered in the debate. Have each student access the data from the Monitoring the Future national survey online. 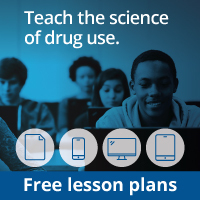 Ask students to record at least one teen drug fact obtained from the site; observe what information students were able to pull from the text and charts that are at a higher reading level.